Why should you engage employees? It has been about a year since we brought Vetter into the world, and during this time we’ve rolled-out countless tweaks, changes and full-fledged facelifts to try and make Vetter more intuitive, user-friendly and engaging. A big part of why we built Vetter was to scratch our own itch – both Duncan and I had worked for massive companies where innovation wasn’t exactly encouraged. We met while working in Asia at a company where the managers were really old school (don’t question your bosses, work overtime without thought of compensation, sign on the dotted line, etc. ), which in retrospect probably pushed us toward the tipping point in deciding to build Vetter – thanks old school managers! What we saw time and time again within our workplaces was that a “new” idea only had credence if it was conceived by a senior employee who had been with the company since they were a toddler, and if someone was below a certain wrung on the totem pole, either their idea was never heard, or they could even be chastised for “challenging” the powers that be. As a result, there was a near total lack of new ideas in the company. With all of this in mind we built Vetter, both to break down these barriers and to help our customers create cultures of innovation and intrapreneurship. 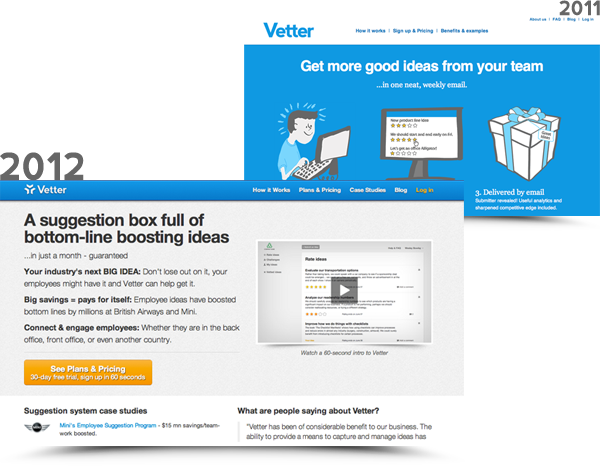 While a lot has changed during our first year of operation, we still have more than a few tricks up our sleeves to help our customers engage employees, and improve their businesses with Vetter.